Why full control permissions on a folder are not inherited by a crt or a pvk file created in the folder? How to sign code automatically without installing anything on any OS? How to implement SNI using openssl configuration file? Can I change SNI field without server knowledge? I recently tried to setup OCSP on one of my nginx servers. Unfortunately I couldn't get it to work and didn't find a solution so far. The fullchain.crt contains the servers cert, the intermediate and the root cert. The server uses SNI since it delivers multiple sites with different certificates. Somebody got an idea what I am missing here? I can't see anything on my webpage. My question is how do I invoke the getJSON call and is console.log() the right way to display data or should i be using document.write()? Also will I have to do a nginx reload everytime my script is run to invoke this function to display the most recent data? My nginx config not work when I rewrite to same domain. The URL should be redirected to the new url like http://example.com/en/this-789-012/2 , But it doesn't. Any solution ?? Also, Please tell me if there are any better solution to write multiple redirect. I think this will make the conf long and difficult to read. I am trying to set up an nginx server that sets certain parameters in a cookie when hit on a certain location. Based on my understanding, after 60 seconds of setting this cookie up the cookie should expire and get removed. However, it persists. Is there anything wrong with this configuration? This happens even though I renewed my certificate and it is valid until December 2019. I have a network folder and two machine accounts, node1$ and node2$, both of them having full control permission on the folder. I log in a SQL Server intance in the node1 machine and back up a SQL Server certificate on the network folder, which generates a crt and a pvk files. Then I log in node2 machine and try to restore the certificate in another SQL Server instance. But I can't because node2$ has no permissions on the requested files .crt and .pvk. Even more, if I check the created files, the very node$1 machine account has no explicit permissions on these files. Instead, I find an "owner rights" ACE. So, the files don't seem to inherit the permissions that node1$ and node2$ have on the folder. This issue doesn't occur with other kind of files. I can solve this by manually assigning explict permissions on the files to node2$. But my question is: why .crt and .pvk files don't inherit the permissions as other types of file do? We've setup a process to manually sign our code using the SIGNTOOL from Microsoft. We generate our installation package using NSIS and it's time to start automating the code signing process as well as part of the NSIS scripts. We do not use windows SDK for development so would prefer not making that a requirement for our developers. We have some people on Mac and Linux as well; anyone can make an installer and the installer maker is what will, hopefully, be signing the code automatically. We are using PFX files to sign the code. So basically I'm trying to figure out, "how can I sign code without installing anything, except maybe one tiny file, so that it works on all three major OSes". Automating with NSIS is handled, but doing it without Windows SDK from any OS is not. I am trying to set up nginx to map TLS connections to different backends based on the SNI server name. From what I can tell, my client is sending the server name, but the preread module is only reading a hyphen. I'm running nginx 1.14.2 on FreeBSD. How can I debug what is happening in the preread module? ================ UPDATE =============== Turned on debug logging. Maybe "ssl preread: not a handshake" is a clue. 2019/04/12 14:49:50 [debug] 61420#0: *9 SSL: TLSv1.2, cipher: "ECDHE-RSA-AES256-GCM-SHA384 TLSv1.2 Kx=ECDH Au=RSA Enc=AESGCM(256) Mac=AEAD"
2019/04/12 14:49:50 [debug] 61420#0: *9 stream map: "" "glance-no-upstream-instance-configured"
It works fine, but now I am trying to implement server-side SNI using the OpenSSL config file and I don't know how can I get the required information to do it. I have taken a look to How to implement Server Name Indication (SNI) and this is a good explanation to do it without openssl config file. But that doesn't work using the file. How can I determine if the server have the certificate requested? Maybe openssl provides the proper certificate by itself? 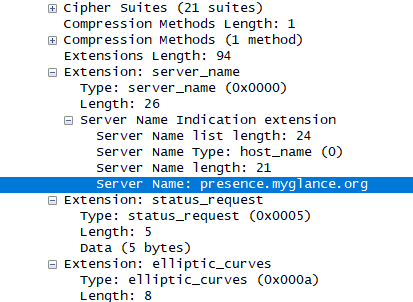 Aware of this, I made an intermediate TCP proxy in order to modify the TLS handshake and the extension information. I tried with removing the extension and recalculating all the lengths. This didn't work because the web browser issued an alert of "unknown certificate", because the server issued the default certificate. As a matter of fact, I know my proxy works because it can load https web pages if I just let the packets pass. I tried with changing the SNI to news.google.com (because it has the same length as www.youtube.com), but then the server issued a bad_error_mac alert. I know this is the philosophy behind the protocol: preventing man-in-the-middle attacks. But how does the protocol know I changed the SNI, given that the handshake is unencrypted? I read the spec, and the hostname does not participate in calculating the MAC. #An infinite loop getting data from the accepted connection, and sending it modified if it must.